Monday October 11th 1897 Will and I went up town, took up a dozen chickens. I got a new carpet for the front room. The boys put up the sitting room stove in the afternoon. I did sweeping and changing things around some up stairs. 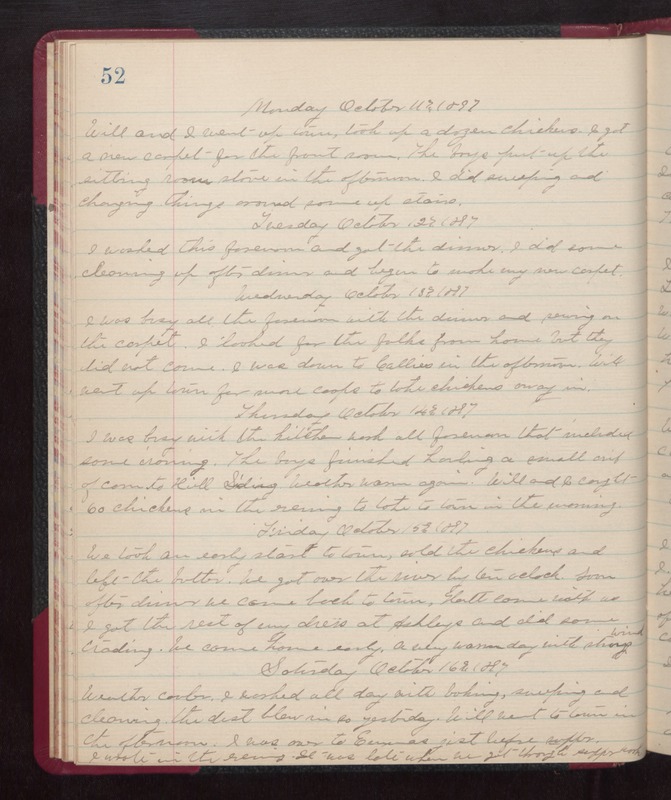 Tuesday October 12th 1897 I washed this forenoon and got the dinner. I did some cleaning up after dinner and began to make my new carpet. Wednesday October 13th 1897 I was busy all the forenoon with the dinner work and sewing on the carpet. I looked for the folks from home but they did not come. I was down to Callies in the afternoon. Will went up town for more coops to take the chickens away in. Thursday October 14th 1897 I was busy with the kitchen work all forenoon that including some ironing. The boys finished hauling a small crib of corn to Hill Siding. weather warm again. Will and I caught 60 chickens in the evening to take to town in the morning. Friday October 15th 1897 We took an early start to town sold the chickens and left the butter. We got over the river by ten o'clock. Soon after dinner we came back to town. Hatt came with us. I got the rest of my dress at Ashleys and did some trading. We come home early. A very warm day with strong wind. Saturday October 16th 1897 weather cooler. I worked all day with baking, sweeping and cleaning. The dust blew in so yesterday. Will went to town in the afternoon. I was over to Emmas jist before supper. I wrote in the evening. It was late when we got through supper.